With recent advancements in the precision of refractive surgery angle kappa stands as an important consideration in improving visual outcomes. Angle kappa is defined as the angle between the visual axis (line connecting the fixation point with the fovea) and the pupillary axis (line that perpendicularly passes through the entrance pupil and the center of curvature of the cornea). It can be identified clinically by the nasal displacement of the corneal light reflex from the pupil center,  and it represents a misalignment of light passing through the refractive surface of the cornea and the bundle of light formed by the pupil. [Figure 1] depicts a coronal view of angle kappa as well as the surgeon's view when seen through the microscope. A Pubmed literature review was conducted for several terms related to angle kappa and refractive surgery. Relevant manuscripts were compiled into this review to summarize the current literature on the role of angle kappa in refractive surgery, specifically as it relates to PRK, LASIK, and placement of multifocal intraocular lenses (MFIOLs). A thorough PubMed search was conducted using various combinations of the following terms: Angle Kappa, LASIK, PRK, Intraocular lenses, Capsulorrhexis, Centration, Refractive Surgery, Cataract Surgery, Pupillary Axis, Visual Axis, Coaxial Axis, Pupil Tracking, and Hyperopia. The search was limited to articles of the following types: Reviews, systematic reviews, randomized controlled trial, practice guidelines, meta-analysis, journal article, guideline, clinical trial, and case reports. The initial literature review resulted in 66 articles. From the initial inquiry articles were chosen based on their relevance to Angle kappa, MFIOLs, LASIK, PRK and Hyperopia. In total 40 articles were selected, reviewed for relevant content, and compiled into this review. Multi-focal intraocular lenses (MFIOLs) are designed with concentric apodization to provide functional vision at distance as well as near. With this design distance and intermediate visual acuity are adversely affected if the lens is decentered. The etiology of this is not fully understood. Decentration can also cause photic phenomenon  and is one of the main indications for MFIOL exchange. A large angle kappa could contribute to functional decentration if the MFIOL is centered on one axis, (pupillary or visual axis) and is not aligned with the other. In 2011 Prakash et al reported that larger preoperative angle kappa values in MFIOL placement were correlated with patient complaints of glare (R 2 = 0.26, P= 0.033). They also reported that perceived severity of haloes were correlated to angle kappa and postoperative uncorrected distance visual acuity (UCVA) (R 2 = 0.26, P = 0.029). While positive angle kappa may play a role in contributing to glare and haloes, dissatisfaction with MFIOLs is truly multifactorial. 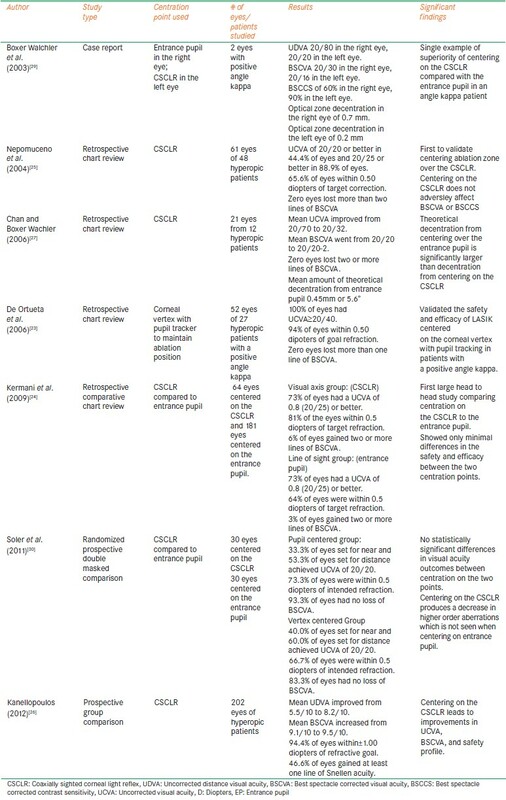 Blurry vision of various etiologies,  other forms of photic phenomenon,  and unsatisfactory postoperative distance UCVA  are more common patient complaints after receiving MFIOLs. kappa. Melki and Harissi-Dagher described a method for centering the capsulorrhexis on the coaxially sighted intraocular lens reflex instead of the corneal reflex as a way to accommodate for angle kappa. These methods may be effective but have not been validated in large studies. More research is needed to determine their clinical relevance. Based on the current literature, a large angle kappa may contribute to decentration of MFIOLs potentially resulting in glare and decreased visual acuity. However, the clinical significance of lens decentration as a direct result of angle kappa is not fully understood. There is no evidence to show that altering centration of MFIOLs is detrimental or dangerous for the patient. Thus we recommend centering these lenses on the corneal reflex in eyes with angle kappa values greater than the normative values discussed earlier as per eye and per topography system used. Corneal Vertex Normal: In 2006, De Ortueta et al centered ablation zones on the corneal vertex normal,  which is the point of maximum elevation in corneal topography. This was combined with videokeratoscopy/pupil tracking which allowed the ablation zone to shift a fixed amount in relation to the center of the pupil as it changed with differing light conditions. The results of this study are summarized in [Table 2]. These four methods of centration have not simultaneously been compared in head to head trials. The following will discuss what has been accomplished in the literature specifically as it relates centering in patients with a large angle kappa. Several studies are found in the literature that demonstrate the benefits of moving centration for hyperopic LASIK to the CSCLR to adjust for a large angle kappa. This review focused on hyperopic LASIK as hyperopes are more likely to have a large angle kappa. These studies are summarized in [Table 2]. In 2011, Soler et al published the only randomized double masked comparison of pupil centered vs. corneal reflex centered hyperopic LASIK. This study concluded that there were no statistical differences in terms of safety, efficacy, or accuracy between the two different centration points  However, this study was limited by a small sample size and by a patient population of mild to moderate hyperopes. The smaller angle kappa values associated with lower degrees of hyperopia may have masked prominent differences between the two centration options. We recommend using the corneal reflex when performing LASIK on hyperopes, especially when they have a large angle kappa. Centering over a point half of the distance between the CSCLR and the pupil center may also be an effective method in angle kappa patients. Using the entrance pupil when performing LASIK on myopes or mild hyperopes with a small angle kappa is safe and efficacious as the entrance pupil and CSCLR will nearly align. A large double masked head to head trial comparing the various centration techniques is needed to further guide this debate. This study would be most helpful if it had a large array of hyperopes with multiple ranges of angle kappa values that could be individually analysed. There have been very few studies conducted concerning angle kappa and PRK. 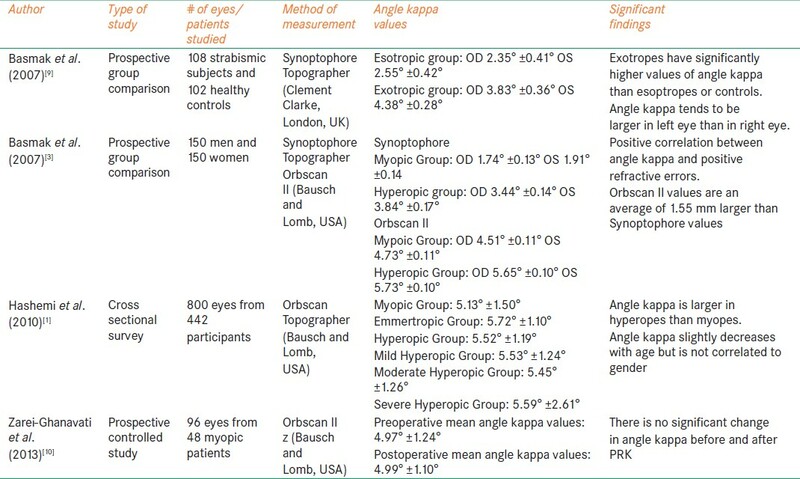 Many of these studies only indirectly address angle kappa by touching on principles of decentration in myopes or principles applied to hyperopic surgery where angle kappa is more prevalent. The results of these studies are summarized in [Table 3]. In 1993, Cavanaugh et al published a separate study on PRK centered over the entrance pupil, which measured the average amount of decentration from the corneal vertex that occurs and resultant effects on visual acuity. They reported a positive correlation between preserved UCVA and BCVA in patients whose decentration was less than 1.0 mm. This would suggest that if PRK is centered on the entrance pupil in a patient with a large angle kappa, decentration may be insignificant if it is less than 1.0 mm. However, the relevance of this measurement is hard to extrapolate as the authors centered their procedures over the entrance pupil but then measured decentration from the corneal vertex. The data regarding angle kappa and PRK is very limited, and no specific conclusions can be drawn. This is likely to be due to the limited number of publications on the topic of angle kappa combined with the nationwide trend to perform LASIK more frequently than PRK. Although the limited data suggest that centering on the entrance pupil is safe and effective, this data comes largely from studies which only indirectly addressed the issue of angle kappa. Centering on the entrance pupil may be safe if the ablation zone is made large enough to cover the misalignment induced by angle kappa. The optical and refractive principles of PRK very closely mimic those used in LASIK. Given this similarity and the body of evidence which supports LASIK centration over the corneal reflex, we recommend centering PRK over the corneal reflex in patients with a large angle kappa. Angle kappa is of great importance in refractive surgery, particularly when treating hyperopes, who tend have large angle kappa values. In some instances, this may also be important for myopes. Angle kappa may play a role in MFIOL decentration, possibly leading to increased glare and haloes. This decentration may be clinically insignificant; however, centering the MFIOLs on the corneal reflex will likely decrease this risk. In hyperopic LASIK or PRK, centration should be focused on either the corneal reflex or the distance half way between pupillary center and the corneal reflex, especially in patients with a large angle kappa. Further studies are needed to fully establish the difference between the various centration methods used in refractive surgery and their effects on eyes with a large angle kappa. Special thanks to Cody Hockin, Graphic Designer, BFA Visual Communication, for his assistance in generation of [Figure 1]. This research received no specific grant from any funding agency in the public, commercial, or not-for-profit sectors. 1. Hashemi H, Khabazkhoob M, Yazdani K, Mehravaran S, Jafarzadejpur E, Fotouhi A. Distribution of angle kappa measurements with Orbscan II in a population-based survey. J Refract Surg 2010;26:966-71. 2. Park CY, Oh SY, Chuck RS. Measurement of angle kappa and centration in refractive surgery. 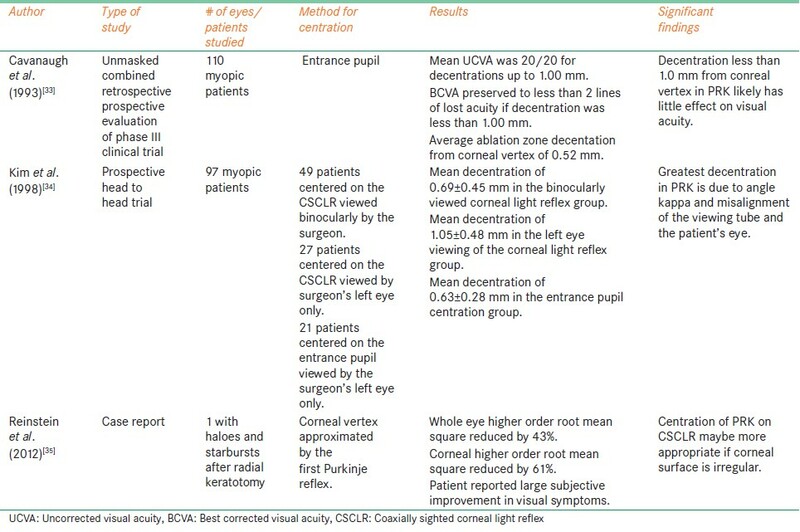 Curr Opin Ophthalmol 2012;23:269-75. 3. Basmak H, Sahin A, Yildirim N, Papakostas TD, Kanellopoulos JA. Measurement of angle kappa with synoptophore and Orbscan II in a normal population. J Refract Surg 2007;23:456-60. 4. Pande M, Hillman JS. Optical zone centration in keratorefractive surgery. Entrance pupil center, visual axis, coaxially sighted corneal reflex, or geometric corneal center? Ophthalmology 1993;100:1230-7. 5. Prakash G, Prakash DR, Agarwal A, Kumar DA, Agarwal A, Jacob S. Predictive factor and kappa angle analysis for visual satisfactions in patients with multifocal IOL implantation. Eye (Lond) 2011;25:1187-93. 6. Hayashi K, Hayashi H, Nakao F, Hayashi F. Correlation between pupillary size and intraocular lens decentration and visual acuity of a zonal-progressive multifocal lens and a monofocal lens. Ophthalmology 2001;108:2011-7. 7. Kermani O, Schmeidt K, Oberheide U, Gerten Gl. Hyperopic laser in situ keratomileusis with 5.5-, 6.5-, and 7.0-mm optical zones. J Refract Surg 2005;21:52-8. 8. Srivannaboon S, Chotikavanich S. Corneal characteristics in myopic patients. J Med Assoc Thai 2005;88:1222-7. 9. Basmak H, Sahin A, Yildirim N, Saricicek T, Yurdakul S. The angle kappa in strabismic individuals. Strabismus 2007;15:193-6. 11. Berrio E, Tabernero J, Artal P. Optical aberrations and alignment of the eye with age. J Vis 2010;10:34. 12. Leysen I, Bartholomeeusen E, Coeckelbergh T, Tassignon MJ. Surgical outcomes of intraocular lens exchange: Five-year study. J Cataract Refract Surg 2009;35:1013-8. 13. Woodward MA, Randleman JB, Stulting RD. Dissatisfaction after multifocal intraocular lens implantation. J Cataract Refract Surg 2009;35:992-7. 14. De Vries NE, Webers CA, Touwslager WR, Bauer NJ, De Branbander J, Berendschot TT, et al. Dissatisfaction after implantation of multifocal intraocular lenses. J Cataract Refract Surg 2011;37:859-65. 15. Rosales P, De Castro A, Jiménez-alfaro I, Marcos S. Intraocular lens alignment from purkinje and Scheimpflug imaging. Clin Exp Optom 2010;93:400-8. 16. Berdahl JP, Waring GO. Match right lens to patient needs: 10 objective measurements can improve multifocal IOL implantation outcomes [monograph on the internet]. Ophthalmology Times, 2012. p. 28-9. Available from: http://digital.healthcaregroup.advanstar.com [Last cited 2013 Oct 4]. 17. Solomon R, Donnenfeld ED, Perry HD, Stein JJ, Su MY, Holladay, JT. Argon laser iridoplasty to improve visual function following multifocal IOL implantation. Poster presented at: The AAO Annual Meeting; November 12, 2007; New Orleans, LA. 18. Melki SA, Harissi-dagher M. Coaxially sighted intraocular lens light reflex for centration of the multifocal single piece intraocular lens. Can J Ophthalmol 2011;46:319-21. 19. Uozato H, Guyton DL. Centering corneal surgical procedures. Am J Ophthalmol 1987;103:264-75. 20. Enoch JM, Laties AM. An analysis of retinal receptor orientation. II. Predictions for psychophysical tests. Invest Ophthalmol 1971;10:959-70. 21. Mandell RB. Apparent pupil displacement in videokeratography. CLAO J 1994;20:123-7. 22. Fay AM, Trokel SL, Myers JA. Pupil diameter and the principal ray. J Cataract Refract Surg 1992;18:348-51. 23. De Ortueta D, Schreyger FD. Centration on the cornea vertex normal during hyperopic refractive photoablation using videokeratoscopy. J Refract Surg 2007;23:198-200. 24. Kermani O, Oberheide U, Schmiedt K, Gerten G, Bains HS. Outcomes of hyperopic LASIK with the NIDEK NAVEX platform centered on the visual axis or line of sight. J Refract Surg 2009;25 Suppl 1:S98-103. 25. Nepomuceno RL, Boxer Wachler BS, Kim JM, Scruggs R, Sato Ml. Laser in situ keratomileusis for hyperopia with the LADAR Vision 4000 with centration on the coaxially sighted corneal light reflex. J Cataract Refract Surg 2004;30:1281-6. 26. Kanellopoulos AJ. Topography-guided hyperopic and hyperopic astigmatism femtosecond laser-assisted LASIK: Long-term experience with the 400 Hz eye-Q excimer platform. Clin Ophthalmol 2012;6:895-901. 27. Chan CC, Boxer Wachler BS. Centration analysis of ablation over the coaxial corneal light reflex for hyperopic LASIK. J Refract Surg 2006;22:467-71. 28. Kermani O. Alignment in customized laser in situ keratomileusis. J Refract Surg 2004;20 Suppl 5: S651-8. 29. Wachler BS, Korn TS, Chandra NS, Michel FK. Decentration of the optical zone: centering on the pupil versus the coaxially sighted corneal light reflex in LASIK for hyperopia. J Refract Surg 2003;19:464-5. 30. Soler V, Benito A, Soler P, Triozon C, Arné JL, Madariaga V, et al. 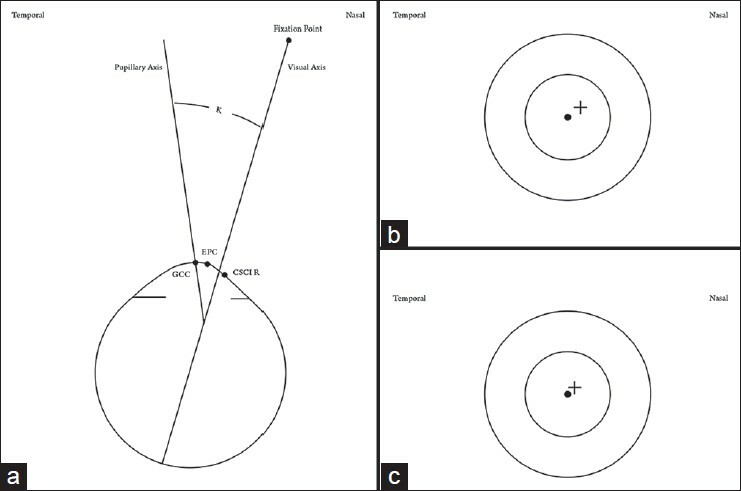 A randomized comparison of pupil-centered versus vertex-centered ablation in LASIK correction of hyperopia. Am J Ophthalmol 2011;152:591-9.e2. 31. Cavanaugh TB, Durrie DS, Riedel SM, Hunkeler JD, Lesher MP. Centration of excimer laser photorefractive keratectomy relative to the pupil. J Cataract Refract Surg 1993;19 Suppl:S144-8. 32. Legrand Y, El Hage SG. Physiologic optics. In: Springer series in optical sciences. Berlin, Germany: Springer; 1980. p. 72. 33. Cavanaugh TB, Durrie DS, Riedel SM, Hunkeler JD, Lesher MP. Topographical analysis of the centration of excimer laser photorefractive keratectomy. J Cataract Refract Surg 1993;19 Suppl:136-43. 34. Kim EK, Jang JW, Lee JB, Hong SB, Lee YG, Kim HB. Comparison of corneal centering in photorefractive keratectomy. Yonsei Med J 1998;39:317-21. 35. Reinstein DZ, Archer TJ, Gobbe M. Is topography-guided ablation profile centered on the corneal vertex better than wavefront-guided ablation profile centered on the entrance pupil? J Refract Surg 2012;28:139-43. 36. Lin DT, Sutton HF, Berman M. Corneal topography following excimer photorefractive keratectomy for myopia. J Cataract Refract Surg 1993;19 Suppl:149-54. 37. Dausch D, Klein R, Schröder E. Excimer laser photorefractive keratectomy for hyperopia. Refract Corneal Surg 1993;9:20-8. 38. Dausch D, Smecka Z, Klein R, Schröder E, Kirchner Sl. Excimer laser photorefractive keratectomy for hyperopia. J Cataract Refract Surg 1997;23:169-76. 39. Okamoto S, Kimura K, Funakura M, Ikeda N, Hiramatsu H, Bains HS. Comparison of myopic LASIK centered on the coaxially sighted corneal light reflex or line of sight. J Refract Surg 2009;25 Suppl 10:S944-50. 40. Arbelaez MC, Vidal C, Arba-mosquera S. Clinical outcomes of corneal vertex versus central pupil references with aberration-free ablation strategies and LASIK. Invest Ophthalmol Vis Sci 2008;49:5287-94.